Oceanside, CA (October 17, 2013) – Brixton is excited to announce Neville Sales Group as the brand’s Midwest Sales Representative. The Neville Sales Group includes Mike Neville, Brooke Neville, Brad Steuer and Ted Lakeman and is a key addition to Brixton’s sales team as the brand continues to expand. Neville Sales Group founder Mike Neville, a Green Bay native, comes to Brixton with over 15 years of sales experience in the action sports industry including 13 years with Sole Technology brands Altamont, Thirty-Two, Etnies, Emerica and eS. Mike and his agency have also been the recipients of multiple sales rep of the year awards for their outstanding work. Founded in 2004, Brixton is the collaboration of three friends who wanted to convey their lifestyle through unique products. 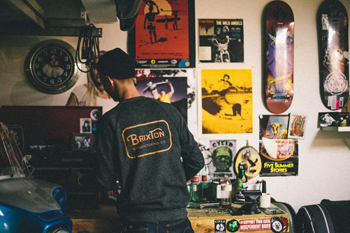 Based in Oceanside, CA, Brixton manufactures a full line of apparel, headwear and accessories and is distributed in over 30 countries. The clean, classic design of the Brixton collection has a modern yet timeless feel and each piece is constructed with the commitment to bringing customers quality product they’ll want to hold onto forever. For more information on Brixton visit www.brixton.com and follow @brixton.